Could the moon have played a role in UK’s heat wave ? 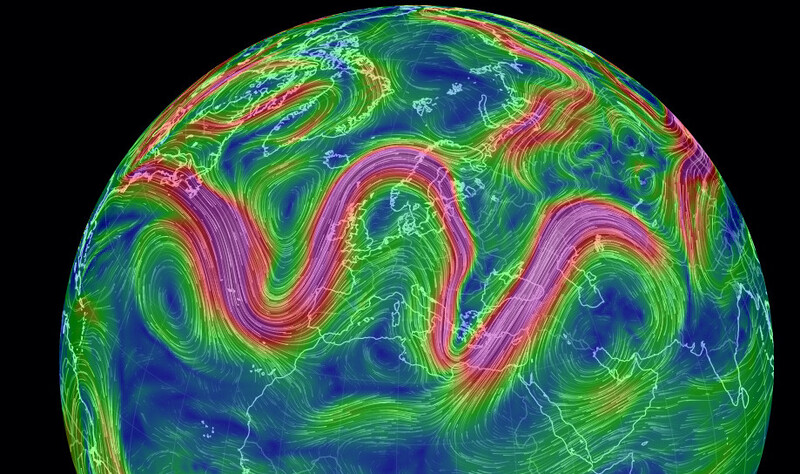 An ‘Omega’ pattern of Jet Stream Rosby waves developed in early July dragging hot air up from Spain. This coincided with a full moon with maximum summer tides. I am no meteorologist but even I can understand how this ‘Omega pattern’ in the Jet Streams must drag hot Spanish/N. African up air over the UK. So let’s look at the ECMWF charts from the neap tide on June 25 and the full moon tide on Feb 3rd. A full moon generates the largest tides in the northern hemisphere in summer, whereas a new moon dominates in winter. Having studied this for about a year I am convinced that statiscally the data now prove that there is an effect, particlularly in winter. So how could the Jet Stream flow possibly be disturbed by an increasing atmospheric tide? The main effect of tides is the tractional (horizontal) N-S component which is unaffected by gravity. The rotation of the earth generates a variable torque whose strength depends on the lunar cycle of neap and spring tides. Dr. Clive Best link articolo Could the moon have played a role in UK’s heat wave ?